Monday Morning-Green smoothie before AM shift. 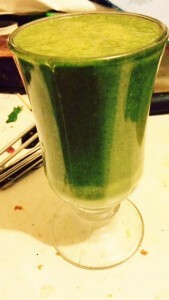 Kale, spinach, cashew milk, almond milk, Aloha protein powder, Matcha, banana, plum jam, chia seeds, coconut oil. Late, cold, delicious dinner. 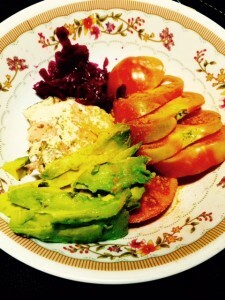 Salmon, avocado, heirloom tomato, sauerkraut. 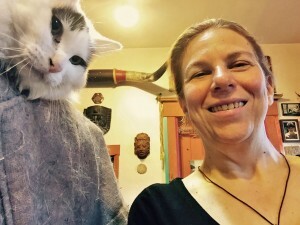 The cat is not impressed. And no, it's not my cat either, although without gluten/sugar/grains/legumes/dairy in my life, my horrible cat-allergy (and my various dust/pollen allergies) are nowhere to be seen. I realize correlation does not equal causation...I'm just sayin'.